In 1532, Niccolò Machiavelli published a now-famous treatise on leadership and governance. ‘Il Principe’ advised that, in an imperfect world, man must do whatever it takes to succeed and thrive. Machiavelli argued that the ends always justify the means, and his opus became a seminal text in the fields of modern politics and philosophy. Today, the Italian is the doyen of flaccid middle-managers and unscrupulous politicians everywhere. On the football field, however, his brutalist church has at least one devoted worshipper. Marco Materazzi is not a likeable fellow. Nobody was surprised when he beat Harald Schumacher and Samir Nasri to the title of ‘Most Hated Footballer’ in a France Football poll in 2016 and, a decade on from that infamous night in Berlin, the Materaciste is still persona non grata on the boulevards of Paris and the wineries of Bordeaux. Materazzi, however, doesn’t care what you think. Gold medals from the World Cup, Champions League, Serie A and the Coppa Italia would protect even the most ephemeral ego, let alone that of a man who thrives on antipathy and vengeance. Regardless of what you think of him as a person, his record is unflinching. His career, strewn with violence and victory, is untouchable. Forty-four minutes into the game in Guwahati, a familiar red tide began to rise. The Chennaiyin manager, incensed at the sending off of Harmanjot Khabra, couldn’t resist a dig at his counterpart on the sidelines. César Farías took the bait happily, prompting a scrum to break out amongst the players on the pitch. Marco Materazzi was still causing trouble; after a stumbling start on the sub-continent, the Italian would lead the Blue Devils to their first league title, adding another trophy to his golden haul, this time as a manager. Even on the other side of the touchline, Il Principe can’t stop starting fights and winning matches. The son of former Lazio and Sporting manager Giuseppe, Materazzi was born in Lecce on 19 August 1973. A tall and precocious athlete, he overcame the death of his mother aged 15 to join his father’s team Messina Peloro as a teenager, before a fallout caused him to quit for an amateur side, Tor Di Quinto. A brief flirtation with basketball followed, before formative stints with Marsala and Trapani in the lower echelons Italian football. It was here that Materazzi would gain his uncompromising thirst for victory, in a place where he learned quickly that “if you wanted justice, you had to find it yourself”. His aggressive performances soon attracted the attention of Umbrian outfit Perugia, who signed him in 1995. Either side of a short loan spell at Carpi, he helped Jay Bothroyd’s former employers secure promotion to Serie A, where more established clubs began sniffing around. Unwilling to sell their young asset to a domestic rival, Perugia accepted the advances of Everton and Walter Smith in the summer of 1998. “With his presence and aggression … he will handle the Premiership no problem,” enthused the po-faced Scot. It wasn’t exactly prophetic. Twenty-seven appearances and four red cards later, Materazzi’s Italian job was aborted. The Liverpool Echo was less than gushing, with David Prentice suggesting that he had “convinced nobody of his pedigree as an international defender”. In a later interview with FourFourTwo, Materazzi would remain adamant that at least one of those red cards was unfair. It was indicative of a temperament that had him labelled as a hot-headed liability, and the bed was feathered for a quick return to Perugia in 2000. It would be in his homeland where Materazzi’s talent finally caught up with his temper. 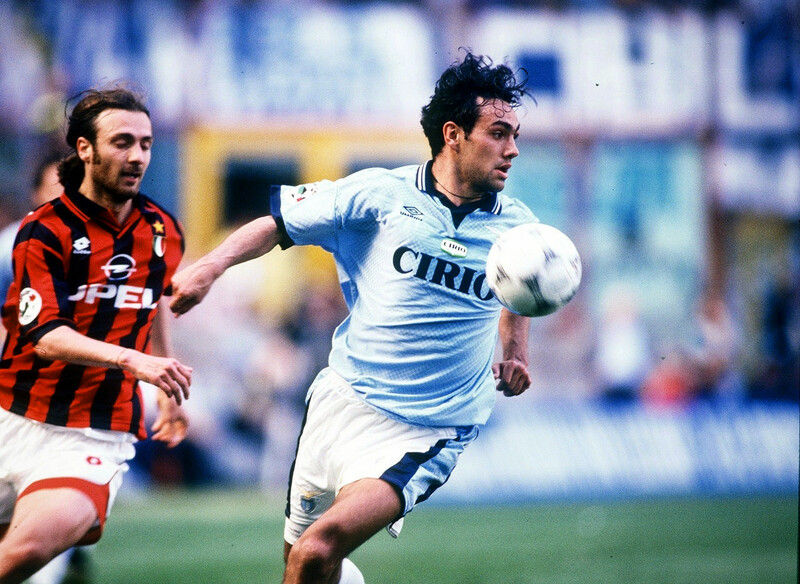 After establishing himself as a regular in the side, he went on to break Daniel Passarella’s record for goals scored by a defender in Serie A with 12 strikes in 2001. Under the verve of Serse Cosmi and the braggadocio of Luciano Gaucci’s chairmanship, Perugia would finish comfortably in mid-table, with Materazzi’s brusque talents attracting glances from the top Italian sides. 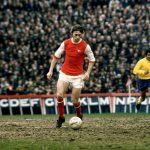 His no-nonsense performances at the back were gilded by a howitzer of a left foot that dispatched penalties and free-kicks with devastating accuracy, and even the most half-hearted of football observers knew he had outgrown his surroundings. In the end, it was Inter who jumped the queue, the incoming Héctor Cúper splashing out on the Grifoni captain. Cúper had taken Valencia to the brink of European glory in the previous two seasons, and the Argentine sought to end Inter’s Scudetto drought by reinforcing the squad with the likes of Francesco Toldo, Cristiano Zanetti and Sérgio Conceição. Alongside the sprightly Colombian Iván Córdoba, Materazzi would provide the backbone of a fearsome Inter defence, while the talismanic Christian Vieri finished teams off at the other end. Things went so well for so long, with Inter leading the table right up until the last day of the season before succumbing to defeat against an insipid Lazio. The slip-up paved the way for Marcello Lippi’s Juventus to claim the trophy, with Antonio Conte keen to rub it in against his bête noire personally. After his Perugia side had beaten Juventus to gift the title to Lazio in 2000, Materazzi had rushed into the defeated side’s dressing room to gloat. Conte, incensed at this transgression, dedicated Juve’s subsequent title win to him. Whilst falling at the very last hurdle, the beginnings of a hardened Inter side were taking root. The ‘Grass Snake’ was slowly shedding its underachieving skin, with Materazzi’s abrupt leadership providing the venom. The following year brought the Interisti a step closer to a trophy, but once again Cúper’s charges fell just short. Alberto Zaccheroni, brought in to replace the underachieving Argentine the following year, couldn’t inspire his side beyond a fourth-place finish despite the goals of Adriano and the Júlio Cruz. Frustrated by the lack of a progress on the pitch, Massimo Moratti appointed Roberto Mancini as coach in 2004. The Italian had worked wonders in impossible financial situations, first with Fiorentina and then Lazio, bringing the former to a brilliant Coppa Italia victory before steadying the Cragnotti oil tanker in Rome. After a solid third place finish and their first trophy in almost a decade, the following year would bring Inter to a long-awaited title, albeit in the most controversial circumstances. The Calciopoli scandal was a disastrous moment for Italian football, but it was one from which Inter would benefit enormously. 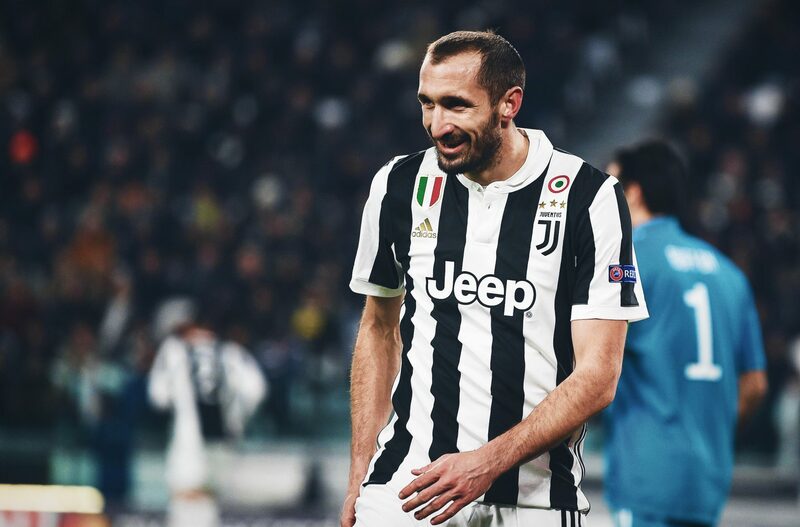 The Milan and Juventus empires wore torn down at a stroke, and the Nerazzurri, despite enjoying an almost identical season by finishing third, would later be given the title at the Turin side’s expense. This, however, would not be the biggest news in Italian football that year. Materazzi had made his Italy debut in 2001 and had failed to convince in dislodging the impenetrable Alessandro Nesta and Fabio Cannavaro. This remained the case right up until Italy’s last game of the 2006 World Cup in Germany. Nesta, no stranger to misery in international football, pulled up against the Czech Republic with a suspected groin strain. With Italy due to face Guus Hiddink’s Australia in the second round, Materazzi’s chance had finally arrived. After scoring against the Czechs, he would be in the starting line-up against the Socceroos. He very nearly blew it. During a turgid match, Materazzi would be sent off for a foul on Mark Bresciano, before Francesco Totti secured Italian passage into the next round. A 3-0 victory over the lacklustre Ukrainians set up a blockbuster clash against Germany in the semi-finals. The hosts were far from their best, but on home soil and with a pulsating nation behind them, the Italians faced their first true test in the competition. It would prove to be a thrilling encounter, Fabio Grosso’s last-minute curler followed by an Alessandro Del Piero kick in the teeth contriving to send the Germans crashing out. 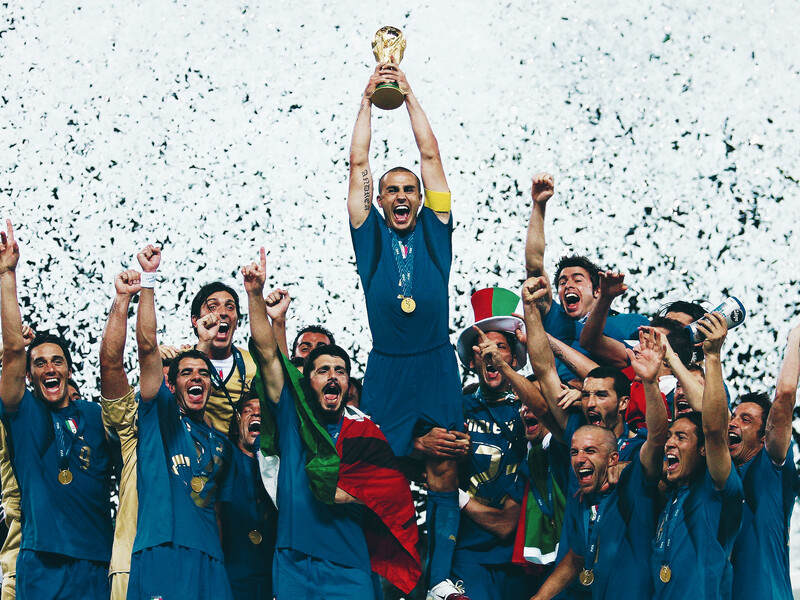 Italy, spurred on by the inspirational Cannavaro and with Materazzi back from suspension, were through to the final against France. Managed by the inimitable Raymond Domenech, the French had largely relied on the verve of Franck Ribéry and the wizardry of Zinedine Zidane throughout the tournament. The latter, due to retire after the game, had captured the attention of the footballing world with his virtuoso performances. Fans were united in their appreciation of what seemed a perfect swansong for the Marseillais, with a World Cup win being a natural conclusion. The match, however, belonged to Materazzi. After conceding the penalty from which Zidane scored a delightful opener, it was the Italian’s bullet header which restored parity between the sides. An open game saw France exert increasing control, before Zidane’s infamous coup de boule brought a shameful end to his career and turned the game in Italy’s favour. The resulting penalty shoot-out saw Materazzi slam home his effort before Grosso sealed Italy’s first World Cup win since 1982. Not much more can be said about that moment, when Zidane threw away his country’s chances with a gesture of foolish bravura. The symbol of France’s uneasy ‘black blanc beur’ idyll had, with one action, shattered his World Cup hopes and sent shockwaves through his home country, prompting a debate on things as varied as French immigrant culture to masculinity. For Materazzi, though, it was his most naked Machiavellian triumph. He had done what he needed to do, provoking his opponent into an act of lunacy that rewarded him and his team-mates a thousand-fold. It seemed, finally, that he had learned how to channel his aggression. Whilst the countless YouTube videos showcasing his most brutal fouls continue to attract admirers, the Italian remained one of the most reviled footballers on the continent. His horrible attacks against the likes of Bruno Cirillo and Juan Pablo Sorín left a bitter taste in most football fans’ mouths and, while the incident with Zidane would do nothing to endear him any further, it showed at least that Materazzi had worked out how to add guile to his guillotine. Back home, Inter would go on to dominate Serie A, winning an incredible 17 games in a row in the 2006/07 season. Zlatan Ibrahimović and Patrick Vieira, plucked from the relegated Juventus, brought swagger back to the San Siro, as Inter recorded almost a hundred points on the way to their second consecutive league title. Materazzi, now a god amongst the Nerazzurri faithful, came third in the scoring charts behind the Swede and Hernán Crespo. A phenomenal campaign was capped when Materazzi secured the award for Serie A Defender of the Year in 2007. The terrone from Lecce, so unloved and vilified throughout his career, had conquered the world through determination and will. Another year and another Serie A title followed, before José Mourinho replaced Mancini at the helm. The Portuguese had taken the Premier League by storm before leaving Chelsea after a disagreement with Roman Abramovich. Courted by almost every major team in Europe, it was Massimo Moratti who secured his signature. With his pragmatic style and uncompromising desire to win, Materazzi was greeted with a kindred spirit on the other side of the white line. “Drive, cleverness, knowledge, experience and empathy” – those were the words of the defender when the Gazzetta Dello Sport asked him to sum up his manager’s strengths. “He presses all the right buttons, not just his players.” It would certainly prove to be the case. In a tumultuous three-year stay, Mourinho managed to draw the ire of most Italian coaches and commentators whilst at the same time bringing unparalleled success to the Curva Nord. Inter were insatiable, sealing a treble with a victory over Bayern Munich in the Champions League final in 2010. 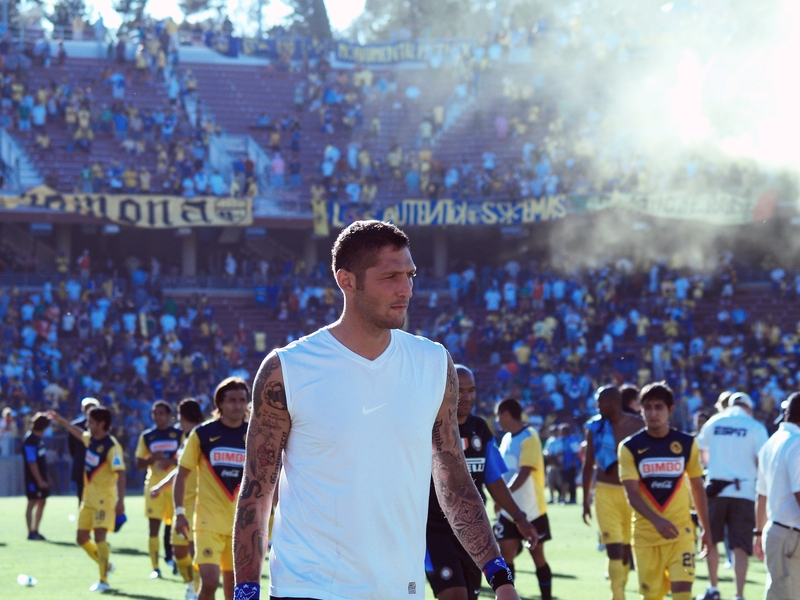 For Materazzi, it was a period where his involvement with the team declined. As a figurehead and elder statesman, however, he remained indispensable to the Inter dressing room. Nowhere can his affection for Mourinho be seen more readily than in the emotional goodbye they shared outside the Bernabéu on that fateful night in Madrid. Everybody knew that the Portuguese would be taking over the Merengues hot seat, but while many thought Materazzi’s tears were borne of sadness, he has an altogether different account: “I knew that if he left, we’d never be the same,” he later confessed in an interview with Sport Mediaset. A legacy built on fury and violent success would soon be dismantled, and Materazzi knew his days were numbered. Following Mourinho, as most managers have found, is a near-impossible task. For Rafa Benítez, however, the Giuseppe Meazza bench would prove to be an insurmountable challenge. The Spaniard’s detached style contrasted sharply with his predecessor’s more involved modus operandi and, for a team used to running onto the pitch smelling blood, the transition from killer to kitten was hard to take. “Benítez was afraid of his own shadow,” mocked Materazzi in an interview with FourFourTwo, recalling the former Liverpool man’s sacking after just six months in charge. Inter would recover to finish second that year under Leonardo, but the rot had started. 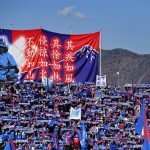 The following season saw the team flail under three consecutive managers, all of whom struggled to motivate a side that had reached the peak and lacked the wherewithal for another climb. Materazzi had left the year before, and with Inter deprived of their gnashing fangs, they could only watch as Juventus reclaimed domestic supremacy. Out of contract and out of the game, Materazzi signed a short-term deal to manage Indian side Chennaiyin in 2014. What many considered a money-making sojourn to the sub-continent turned into a title win in 2015. Yet again, one of football’s most divisive individuals had come out on top. How Inter would love to have his bite in defence today.